How many awesome games haven’t you played because they were never discovered? 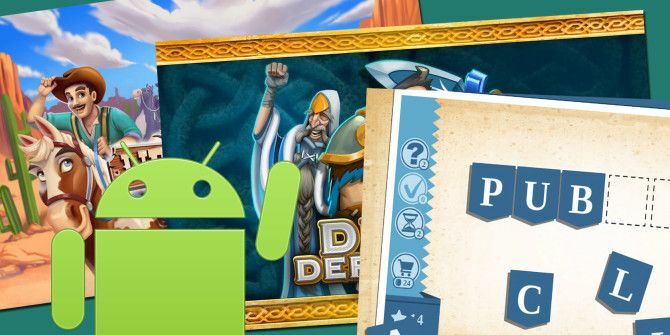 There are plenty of great Android games out there. We’ve covered various genres, such as casual Android games 7 Great Android Games for Casual Gaming 7 Great Android Games for Casual Gaming For those of you who love to play games in random idle moments, here's a list of great games which are entertaining, cheap, casual, silly and easy to pick up and set down. Well okay,... Read More , Android games with minimalist gameplay 6 Gorgeous, Minimalistic Android Games You'll Keep Coming Back To 6 Gorgeous, Minimalistic Android Games You'll Keep Coming Back To There is no better design for smartphones and mobile devices than minimalism. The medium's very nature requires limitations on screen space and power usage, so you really get the most bang-for-your-buck with modern designs -... Read More , and a few awesome Android RPGs 3 Android RPG Games That Rock 3 Android RPG Games That Rock Mobile gaming is known for puzzle games and casual games, but what about the other genres? Games like Angry Birds and World of Goo took the world by storm when they first came out and... Read More . We even have a page dedicated to the Best Android Games that you ought to check out if you haven’t already, but for every Angry Birds, there are dozens of great games that fly under the radar. With this list, my focus will primarily be on gameplay. There are many factors that make a great game, but I consider gameplay to be paramount. Graphics are important too, but I consider a game with strong gameplay and weak graphics to be better than a game with strong graphics but weak gameplay. I also did my best to pick out undiscovered games from different genres, so there’s a little bit for everyone here. Note: These are games that, at the time of writing this article, did not have many downloads or reviews. As there are tons of games that fit this criteria, I’ve done my best to explore as many available games as I can. In the end, this list is both subjective and not exhaustive by any means. Westbound is a western-themed city simulation game for Android that’s reminiscent of many other games in the genre SimCity for Android: What Are Your Options? SimCity for Android: What Are Your Options? SimCity is an excellent game, but EA made a few massive blunders that resulted in a poor launch, disgruntled customers, and a sour taste in everyone's mouths. Even so, no one can deny the city-building... Read More , including Farmville, Paradise Island, and Megapolis. However, instead placing you in charge of building up a city from scratch, the gameplay focuses on the Wild West where you need to survive out in the wild and complete quests in the area. Like most casual games, Westbound starts you off with a tutorial, but I’m impressed by this one because the tutorial incorporates story elements that aren’t jarring to the experience. Most tutorials feel like tutorials, but this one felt like something more. Between the graphics, the music, and the gameplay, I find that I really enjoy this game. There’s a light-hearted and adventurous atmosphere to Westbound that isn’t overly childish or adolescent. I don’t know why this game has so few downloads, but I recommend it to anyone looking for a new contender in the city-sim genre. On first glance, Druid Defenders might look like any other city simulation game, but it’s not. In fact, it’s not a city simulation game at all. It’s more like a tactical battle game with city simulation in between fights to build up troops. Druid Defenders takes a few elements from a variety of genres and puts them together in a coherent way. In the city-building phase, you can build new buildings, train new units, and put up defenses. In the fighting phase, you move around on a battlefield and complete objectives, like destroying the enemies. The cool thing is that the city-building is persistent: you build the city on your own, then use your city in battles in the campaign or against other players, then continue to modify your city even after the battles are over. Yup, Druid Defenders allows you to pit yourself against other players, which is why building city defenses is important. Others can attack you, but you can attack others as well. There are weekly tournaments and a leaderboard, which should be great for those of you with a competitive spirit. All in all, a fun game with great music and graphics to boot. Find The Word is a simple game that you’ve probably seen in dozens of different forms over the years. I used to play a similar Flash game called Text Twist way back in the day. The gist of the gameplay: take a bunch of scrambled letters and arrange them into a word. That’s it, and yet it’s so addictive. Like the gameplay, the artwork for Find The Word is simple, without much eye candy, but it’s fitting. I find it pleasing to the eye and conducive to long sessions of building words, plus the interface is designed well so that it never gets in the way. For puzzle-minded folks, Find The Word is a lesser known variant that deserves some attention. I’m a big fan of Android apps that involve brainpower Get Smarter With Android: 5 Apps For Improving Memory, Math Skills, And More Get Smarter With Android: 5 Apps For Improving Memory, Math Skills, And More "You won't always have a calculator on you!" That's what my math teachers told me all through high school. Little did they know we'd all be carrying around miniature computers in our pockets within the... Read More , but there are games that work your gray matter, too, such as the well-known Bejeweled and undiscovered competitor Mind Resolve. Mind Resolve is new to the Play Store so it currently has two game modes (60 seconds or 25 moves) and two game types (match by color or match by shape), which can be mixed and matched for a total of 4 different games. The object of the game is to match as many objects as you can, either by color or shapes. Matching is done by dragging a line, which can go up/down, right/left, or diagonal, and the line has no max length. The graphics are super simple, which may be a turn off for you, but they don’t bother me. It’s a fun little game that can definitely fill in 10-minute gaps of time when I’m waiting for something. Give it a try. There you have it: four undiscovered Android games that cover the city simulation, tactical strategy, word puzzles, and matching genres. Are these games worthy of “amazing” status? Maybe, maybe not. However, I can tell you that I’ve played a lot of undiscovered Android games and many of them aren’t so good. These, on the other hand, have the potential to be great. Whether or not they get there is for time to tell. Do you know any other fun Android games that nobody knows about? I’d love to give them a try, so please share them with us in the comments! I'm going to try Mind Resolve. Thank you!